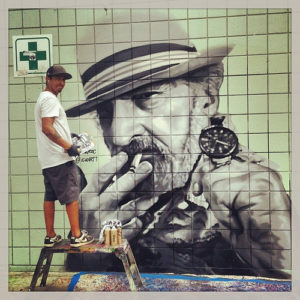 Muralist Brian “TAZROC” Garcia has completed his latest public art installation, a mural depicting Marijuana activist Jack Herer, which can now be seen on the side of the Nile Collective building at 1501 Pacific Ave.
Herer, known as the “Emperor of Hemp”, wrote “The Emperor wears no clothes” a book used in efforts to decriminalize cannabis, and also founded and served as the director of the organization Help End Marijuana Prohibition (HEMP). Herer, who died in 2010 at the age of 70 from complications related to a heart attack, was also memorialized with an indica/sativa hybrid of Cannabis named after him. The “Jack Herer” strain is a cross between Skunk #1, Haze, and Northern Lights #5. The mural is an homage to a famous photograph of Herer smoking a joint.